When ever you are unsure of what type of cookie to make for a party or to give to someone for a gift, stick with the classics. The thumb print cookie is surely that. They are pretty easy to make and everyone seems to love them. You can fill it with any jam or preserves you like, but apricot and raspberry are tried and true. I added a surprise element to these cookies by drizzling them with chocolate. I love the way chocolate and apricots or even raspberry taste together. It also dresses them up a bit for the holidays! But you could omit it or even use white chocolate if you want. Beat butter, margarine and sugar on medium speed of an electric mixer until creamy and fluffy. Add egg yolks and vanilla; beat well. Add combined flour and salt to butter mixture and beat until just blended. Lightly beat egg whites in a small bowl. Set aside. Put chopped walnuts in another small bowl. Form rounded teaspoons of dough into balls; dipping each ball in beaten egg white, then roll in the chopped walnuts. Place cookies on parchment lined cookie sheets. Press thumb or the back of a 1/2 teaspoon gently into center of each ball, to make an indention; fill each cookie with about 1/2 to 3/4 teaspoon preserves. Bake at 350° for 10 to 15 minutes or until light brown. Let cookies cool 2 minutes on cookie sheets before moving to wire racks to cool completely. With a spoon, drizzle melted chocolate over cooled cookies. Let dry and store in airtight container. Great cookies! 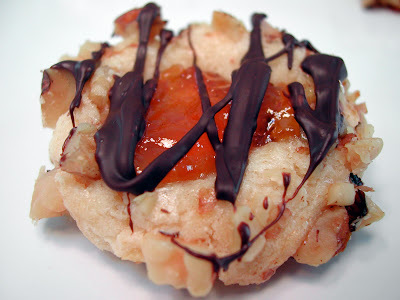 Apricot and chocolate is a great combination. haha, it's true, there are some things you can't change :) kinda like the 7 layer cookies that will be on my blog soon. anywho, these look fantastic, have you tried them with almonds? Looks like a most delicious cookie! these thumb print cookies are delicious and with chocolate on top that does it for me,pretty to look but also good to eat,bambola. 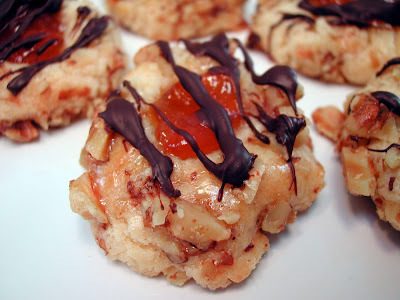 These look good...I have been wanting to try thumbprint cookies but I'm a chocolate fan...so this sounds like a perfect one for me to try! Adding the drizzled chocolate was brilliant. Thumbprints were always on our Christmas cookie list. I just love them. Your blog is healthy, but I remember around this time last year, you made lots of cookies. I like that you used apricot. I always forget to use apricot. Your cookies look great, the chocolate drizzle really dressed them up! I was just trying to come up with a fruity cookie to add to my holiday baking - thanks for thinking for me! !